Designed for behind the cab installation on trucks, the ECO-BC must be mounted vertical with insideout air flow. Also is used for under hood and engine compartment applications. 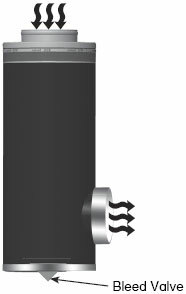 The rubber drain valve in the bottom of the unit allows any ingested water or dirt to drain out.